The other day my wife and I were going through her old things and we found a ‘Scratch and Sniff Guide to New York’. There’s a picture of a delicatessen in the Village and when you scratch and sniff you smell pickles. There’s be a picture of a duck hanging up to dry in China Town and it smell like spicy teriyaki. And then there were garbage bags on Manhattan side walks that smelled like Manhattan Sidewalks and garbage,, and Pizzareas in Little Italy that smell of garlic and cheese. It struck me as amazing that these smells had been in tact for 10 years on the scratch and sniff pad; but also of what a wonderful idea it is to put together a book of the smells of a place. 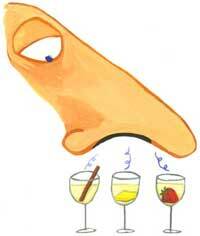 Smell is such an underused faculty, and its only really in wine, that we get a real chance to develop it. Also, its proven that smell is the the strongest psychological trigger we have, and can often bring things we haven’t thought about in years. So if you want to remember your past – start drinking wine every day! Much to my interest I found something online called the Aroma Dictionary. It’s a scratch and sniff guide to the different smells of wine, which is a really great idea. However, a Scratch and Sniff guide to New York makes sense, because you can’t take certain smells with you. But the aromas and scents and nuances to a wine’s bouquet and flavour profile are all around us. Click here to watch Episode #148 of Wine Library TV, and you’ll see what I mean. Gary V takes people through the entire range of flavour profiles one can identify in wine from items that can be picked up in a grocery store and tasted and smelled at your own convenience. I’ve done something similar with a tasting circle I used to be in, and it really helped my understand certain descriptions or profiles that I hadn’t quite grasped. For instance, when people say New Zealand Sauvignon Blanc smells like Pink Grape Fruit, they’re not kidding. At times it can be uncanny. The carnivore in me bays for blood and a Dionysian debauched side screams for sweat and dirt, and thus its always with pleasure when I get gamey profiles, or compost and mushroom, or sweaty saddles in a wine. For these profiles in particular, I always turn to Cote du Rhone, Rioja or Shiraz from Paarl in South Africa. Wine is a sensory thing. There’s no way around it. If you want to have a more eloquent olfactory vocabulary then you need to experience as many smells as possible, and what better place than a Whole Foods, and if you’re not quite into smelling things out in public, then start with your spice rack. Smell Cumin, Anisette, Cinnamon, Nutmeg, White Pepper, Black Pepper. Smell eucalyptus, cedar wood, cigar boxes and try as much as possible to get close to a forest to experience those northern Rhone and Medoc characteristics of ‘pine needles’, wet forest floors, pine sap, barnyard, earth, compost and wild mushroom. And whatever you have to do to smell band-aid, meat, sweaty saddles or gym socks is entirely up to you!